Our Adult Taekwondo Olympic Program is an “ALL in ONE” program. You will experience physical conditioning improvements such as strength, balance, and coordination. You will also learn self-defense, improve self-confidence, and self-esteem, all while getting in shape!! 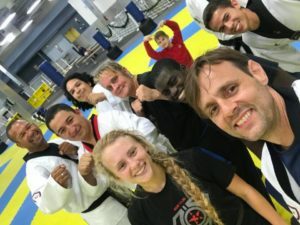 Our comprehensive self-defense and TaeKwonDo Olympic training curriculum focuses on practical stand up and ground-based self-defense techniques to improve awareness, reflexes, and quick thinking! All while in a welcoming, friendly, and family oriented environment !! G3 America’s Olympic TaeKwonDo Competition Program is devoted to developing youth and young adults with proper qualities and techniques, assisting them to become athletes qualified to compete in national and international tournaments, and to become part of the G3 America Martial Arts Competition Team! Experience is not required to participate in the classes and to enjoy them. Everyone starts at their own level, and programs and classes are divided accordingly. This program follows the WTF (World TaeKwonDo Federation) belt system, and classes are always exciting and well balanced. You will learn practical self-defense, improve your conditioning, lose weight, train like a champion, and become a champion! Whether you want to learn self-defense, get fit, or become an Olympic Athlete, G3 America is the Martial Arts School for you!